What this overpaid man has to say about the gender wage gap is shocking! – Put A Number On It! What this overpaid man has to say about the gender wage gap is shocking! A couple months ago, Vox tried to explain economic inequality using cartoons. That article was so deficient and misleading that it inspired me to write a whole rant on how reporting about inequality is often deficient and misleading. The income gap between the rich and the poor struck me as a subject that is actually amenable to an intelligent and balanced analysis. That’s in contrast, just to throw a random example, to the income gap between men and women. So of course, this week Vox decided to explain the gender wage gap using cartoons. And guess what? It’s excellent. It’s well researched (by Claudia Goldin, a woman economist), well written (by Sarah Kliff, a woman editor), and describes an interesting explanation of the gender wage gap – the differing value of specific work hours. Actually, I should say “factor that plays into” instead of “explanation of” the wage gap – it’s a complex effect that is driven by many causes that also interact with each other. The best we can do is identify several such factors and see if they fit data to build a better understanding of what’s going on. So, emboldened by Vox, I will offer two more possible developments contributing to the wage gap that neither invoke nor employ sexism. Also, unlike Mesdames Goldin and Kliff, I will not make a single penny from writing this. Thus I will be counteracting the gender wage gap through personal effort and example. What’s wrong with arguments from sexism? The two “arguments from sexism” regarding the gender wage come from the two ends of the gender-politics horseshoe, and are thus pleasingly symmetrical and equally wrong. The argument from the RadFem-left side of the horseshoe is that women are paid less because oppressive men conspire to pay them less. The argument from the MRA-right is that women are just naturally less talented then men, with some allusion to evolutionary psychology accounting for the talent gap. Prior to collecting any data, we should notice the first argument contradicts basic economic math and the second argument contradicts… evolutionary psychology. Economics tells us that if a wage gap existed, smart companies would profit by hiring women, driving the sexist companies out of business. People often dismiss this argument because of its simplicity, but it’s much more powerful than they realize. The average profit margins for businesses in the US are a mere 9%, while wages and benefits make up more than 60% of employer costs. If the wage gap of 79 cents on the dollar was for equal labor, employers hiring women would save 21% on labor costs, or more than 12% on total costs. This would more than double their profits ,while employers hiring men would go bankrupt. Overpaying for equal labor even by 5% increases your costs by 3%, that’s one third of an average company’s profits. In a competitive economy with high costs of labor, any sexist discrimination in wages large enough to be noticeable is also too costly to survive. Lacking the ability to resolve conflicts in their favor using brute strength, women have evolved to manage conflicts through interpersonal skills. Thus, women are less aggressive but better at persuasion, empathy and cooperation. These talents lead women to dominate occupations that require talking people over to your side, such as: politics, education, sales, entertainment, humanities academia, marketing, law, and all managerial positions in large corporations. This list of occupations covers every single highly paid career except for STEM and medicine. As a result, we see few women wasting their time trying to become doctors but otherwise most women earning higher incomes than men. Now compare that, backed by the fact that women outpace men in educational attainment, to whichever just-so evo-psych story you heard about how women make less because evolved to be less assertive/analytical/hardworking. Which story sounds more reasonable?. Of course, the plausibility of explanations should matter little if we have data. So what does the data say? It says that apparently you can find bias against women, bias against men or no bias at all depending on chance, researcher attitudes and whether Mercury is in retrograde. If these arguments are supported by neither theory nor practice, why do so many people tout them passionately? (Just trust me, you don’t want to see links for this claim, they’re all horrible). I think that these are “beliefs as attire“, they are used mainly to signal loyalty to the RadFem/MRA political group that unifies around blaming the patriarchy/feminism for all its problems. It’s important to remember that reversed stupidity isn’t intelligence: the explanations from sexism aren’t wrong because people believe them for dumb political reasons, they’re independently wrong. 5,000 years ago in Egypt someone proclaimed the crazy idea that the sun is larger than the earth just to curry political favor with the priests of Ra, and was correct by accident. Jobs offer many different things besides compensation, Vox mentions only the obvious one that women trade-off for money: flexible hours needed to raise children. But a job isn’t just the hours and the wages. Plumbers make almost 50% more than teachers, because the latter job is rewarding, high status and lets you work with children, while the former is boring, low status, and lets you work with sewage. This is also true at the higher end of the pay scale: MBA graduate women are likelier to work for non-profits, men likelier to work in corporate finance. Corporate finance isn’t cool, but it pays. Also among MBAs, women are much likelier to work in marketing for big corporations like Coca Cola or Kraft: a very stable job but one with lower wage growth. Men are much likelier to work for hedge funds, where the salary is higher on average but also very volatile, as is the survival of entire company. Remember, when a hedge fund blows up and its male employees find themselves on the street, they immediately drop out of the wage-gap calculation which only includes the fully employed. In happy-nomics terms, women are making the much smarter trade off. The effects on happiness of job security and finding purpose and meaning at work far outweigh the effects of salary increases beyond a certain point. So why do men value money more than flexibility, fun, coolness and stability? There are likely many reasons, one of them is that 72% of women think that men should pay for the first date, and 82% of men agree. More broadly, men’s income correlates very strongly with being married, while women’s income barely does (raw data here). The fact is, both men and women care much more about a man’s salary than a woman’s, and that can be both a cause and an effect of men trading off other benefits for money. Let’s imagine a simple economy consisting of three kinds of jobs. Half the men in our fantasy economy are fighters and make $20,000 a year. Half the women are rogues and also make $20,000. Finally, half of all men and women are wizards, and wizards make $100,000. The average wages for full time employees are $60,000, the same for men and women. Now let’s imagine that the economy outsources all the fighter jobs to orcs/skeletons/China and the fighter men are fired. These men drop out of the employment statistics, and the average wage for employed men shoots to $100,000 since only male wizards have jobs. “Fie the gender wage gap, women make 60 cents on the dollar!” cry the newspapers, even as men face a much worse economic employment situation than the women. There’s some evidence that this is actually happening in our world (the male employment shift, not the orcs). Here’s a gender-composition breakdown of various job categories, and here are the occupations with the largest employment changes. The occupations doing the worst are carpenters, laborers, freight movers and construction workers. These sectors are losing hundreds of thousands of (mostly male) jobs a year. It’s becoming harder and harder for men to find year round, low-paying jobs that would count against the average male wage in the statistics. Some of the men who are laid off from low paying jobs count as unemployed, but many give up on working full-time again and drop out of the labor force entirely. From 1994 to 2014, women’s labor force participation fell by 1.8%, while men’s dropped by a whopping 5.9%. The fastest growing occupations are nurses and personal care aides (and also nursing aides and medical assistants, which is apparently a completely different occupation). These latter jobs also have a constant year-round demand. If you’re a “personal aide to a home nursing assistant” you definitely count in the fully employed statistics. Basically, if you’re doing any sort of assisting or aiding in a medical or home setting, you have no trouble finding stable employment and your wages are slowly rising but still low. Also, you’re probably a woman, which means that you’re contributing to the gender wage gap. Shame on you. So, is there sexist discrimination or not? If that’s the question you’re still asking, you haven’t paid attention. Asking “is there discrimination or not?” is only important for recruiting soldier-arguments in support of your political position. The useful question is: “what should we do to allow men and women thrive in their jobs?” and the answer is: “it’s hard”. My two proposals, that women choose different trade-offs and that the stats are skewed by there being less low-paying jobs for men, are just two of the myriad ways in which the desires, opportunities and paths to employment are different for each gender. The policy takeaway isn’t that there’s no discrimination so we shouldn’t do anything. The takeaway is that we should be careful about proposing solutions to issues that result from a dozen complex developments happening in parallel, until we really understand what’s going on. Understanding this complexity and working to untangle it one piece of data at a time is the fox approach. Unfortunately, the more politically polarizing a subject is, the less patience people have for complexity, and the foxes (and Voxes) are rarely heard over the din. But we can’t make progress on a fox issue with hedgehog answers, we have to keep untangling. 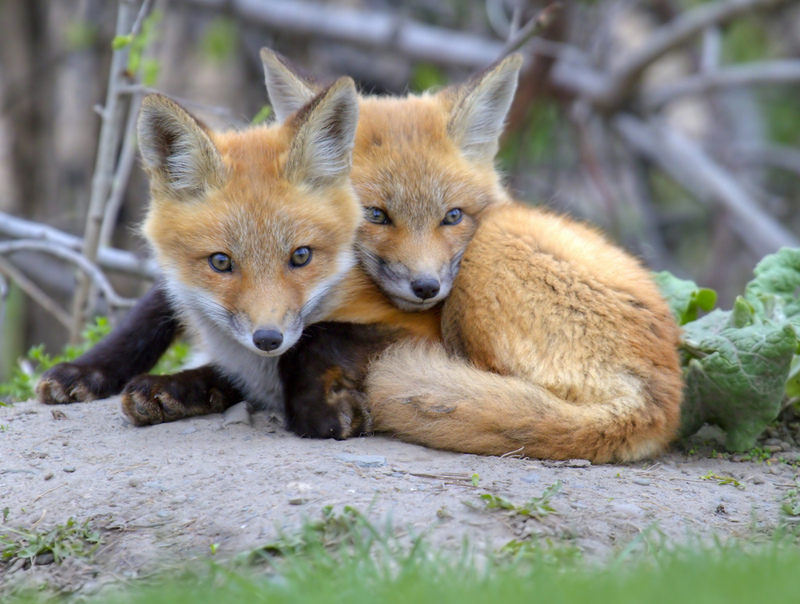 But it’s worth it: just look how cute these foxes are! The marriage correlation could run the other way, men who are married feel more need to support their family rather than financially successful men are more likely to find a wife. I’m not sure what data I’d need to see to demonstrate this as a valid effect, but I’m not sure this is it. Haha. Sorry, I certainly didn’t mean it as an attack on insufficient evidence. This is the first time I’ve heard someone else express the same thought – which is always a nice experience. I didn’t take it as an attack, I think you were absolutely correct to note it. How does the “men are unemployed where women are working lower-paying jobs” possibility deal with the fact that male vs. female unemployment rates are more or less the same? Scott, good question. The number we need to look at is the labor force participation, not just the unemployment rate. Only 5% of American adults are unemployed and looking for work, but almost 40% are not even looking. Among them all the construction workers who were laid off years ago and gave up on full time employment. From 1994 to 2014, men’s labor participation rate fell by 5.9% while women’s fell only by 1.8%. Like I discussed here, the people who are out of the labor force are almost exclusively low-education, and would’ve earned low wages had they been employed. This is more of a “trend” factor than a “state” factor. What I mean is that maybe in the last 20 years many things happened that should’ve closed down the wage gap (less sexism, more women in college) but we don’t see the full effect in the statistics because it has been counteracted by all the laid-off cargo handlers. OMG it’s Slatestar posting on PutaNum’s blogpost. He’s asking a smart question. This is so exciting. And, PutaNum gave a really smart answer. This is like when the Jetson’s met the Flintstones. Dina, thanks for hitting the nail on the head. My argument is actually strongly in favor of nothing because nothing is the best government policy in the absence of knowledge. People only get worked up about the gender wage gap because it’s a political weapon, it can be used to enforce your will on others through the government. For example, accusations of racial discrimination can also be used as a political weapon, as in the case of the government agency who strong-armed an auto lender company out of $100,000,000 because they accused them of racism. How did they know the auto lender was racist? They government agency didn’t actually have any direct data, but they guessed people’s races based on names and zipcodes. You don’t have to be too libertarian to agree than government arbitrarily predating on businesses causes huge harms. Would you want to give people car loans now? Would you want to employ anybody in a country where the government can go after you for pay discrimination that you didn’t engage in? Telling the government “don’t interfere because you don’t know what’s going on” is positively supporting a policy that is much better than the alternatives. There’s a broad consensus for “human activity is the main cause of global warming”. There’s no consensus for “sexist discrimination is the main cause of the gender wage gap”. Enact your policies accordingly. Indeed. It’s very much the opposite of global warming (science) denial. Hell, there is both scientific and anecdotal evidence that these days young women actually get paid more than men for equal work, most notably in tech and IT because there is enormous demand for women there. Great post, but you kind of skirt Vox’s central idea, which is that businesses are stuck in paradigms that disproportionately reward male work patterns. That is, expecting workers to be able to put in long hours in order to advance maybe worked pretty well when the workers were all men, but now it results in about half the potential workforce getting unfairly underrewarded. On this theory, the market hasn’t corrected this because the fix is hard–it involves going against established business culture norms, which is risky and makes you look really dumb if you fail. Or in fantasy economy terms, it’s as if adventuring parties don’t know how to use ranged physical attacks and instead make their rogues fight melee, which they aren’t very good at, so they pay them less. That’s a good point, except that I assume that businesses care about profits and not about fairness. People aren’t paid what’s “fair”, but what the employer can get away with paying them in a competitive market. Your point still stands, but I would explain it as “businesses could get more productivity per unit of salary from their women by structuring around different requirements for specific hours worked, but that restructuring is hard to do”. This is a testable hypothesis, for example I would predict that start-up law firms will have more flexible hours that traditional law firms to get the most from top female lawyers. Or maybe it’s as Goldin says: some jobs are more amenable to hour flexibility than others, and these tend to have much more pay equity like for pharmacists. I personally chose a job with much better hours than many of classmates, and although I wish I could get paid a bit more for working the occasional 11pm-2am time slot, I’m not complaining about the tradeoff. Pingback: Welcome to Put A Num On It! – Put A Number On It! Another point for your first explanation – men are much more likely to die or be injured at work. Women trade off income for workplace safety, along with job security and status. An example is the statistics for Australia, where men accounted for 63% of serious injury claims in 2012-13 and 92% of workplace deaths in 2013. Pingback: Strong men are socialist, reports a study that previously reported the opposite – Put A Number On It! Next Next post: Welcome to Put A Num On It!